he has direct contact with them? Get Your Discounted Copy Now!! entitled "The Unfolding of the Crystal Skulls". 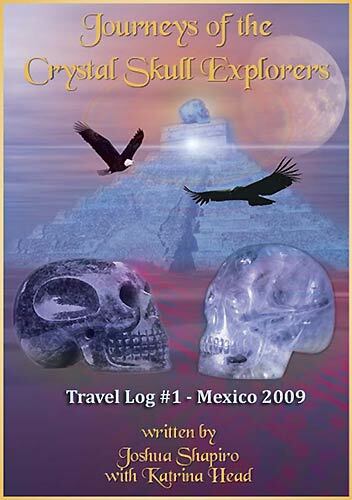 Crystal Skull Documentary, made in 2007.
crystal skulls above to view the newsletter webpage. Have You Ever Wondered What Life Was Like in the Legendary Land of Atlantis? We have received permission to offer this rare book by the publisher for a special discount if you order in time! It discusses the translation of an ancient scroll written in Atlantean that was discovered within an advanced stone structure found on an island in the West Indies in the late 1880's. Have you ever wondered what it would be like to have your own crystal skull(?) -- but, you weren't sure how to go about to get one and especially the right skull for you? Well, now we can finally help people out such as yourself. In this offer, we can provide any size crystal skull you seek (not limited to the small ones that we are offering above). Or maybe you already are a crystal skull caretaker, and your skull or skulls are asking nicely for new brother or sister skull, well again, we might be of some assistance. We are working hard this year to provide a printed version of our book Journeys of a Crystal Skull Explorer in English. We have not yet discovered the best way to offer this printed edition. However, for the moment, due to the popularity of the new e-book readers and apps for tablets and cell/mobile phones we are sharing a special series of e-books called the Travel Log series which shares our world travels with the crystal skulls. Above was a copy of our first Travel Log book dealing with two journeys to Mexico City in 2009. Additionally, via Filament BookClub (to get your copy now, click on this link), they have released a version of this book as an e-book that can be read on a light weight reading device -- just like holding a book in your hands. Filament is the bookclub that is associated with the Coast to Coast radio show and a number of the people who have appeared on that programs are authors who are a part of Filament books. 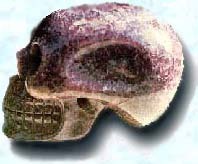 In any case, if you would like to be notified by email when the printed edition of Journeys of the Crystal Skull Explorers is ready (estimating: mid-late part of this year, 2010), please click on the picture of the special crystal skull (called "Ami") below and fill out the on-line form that will be presented. These new versions have a few additional sections that were not included in our original e-book. Starting in 2006, a group of friends in Europe began to create a series of festivals to celebrate and honor the crystal skulls. The first Festival was held in the southeastern part of Holland near the border with Belgium. Two hundred people from several countries attended this event. The second Festival was held in Budapest, in October of 2007 where we surprised to see over six hundred people in attendance. 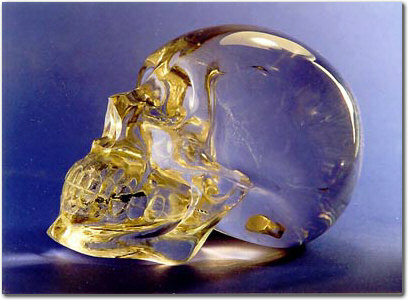 For the year of 2011 and beyond, there are a number of other crystal skull conferences being planned in the world by various organizations. 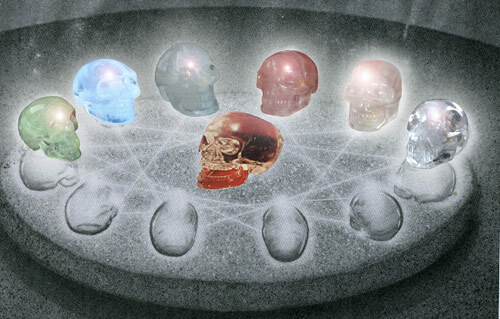 We were very honored to help our friends in Holland with their conference in March of 2011 called "The Unfolding of the Crystal Skulls" for which they plan their next conference in May of 2012. We still hope to be involved in other conferences in the world to continue the energy and goals of the earlier European conferences. Please periodically check the above website for updates or you might want to join our Crystal Skull newsletter, mentioned above for this news. The Crystal Skull World Mission conferences was started in 2004. It was a pre-cursor conference to the one that was later held in Holland in 2006. The first conference was organized by the Heyyanka Foundation, IKA international and the World Mystery Research Center. Jan Ackermann of the Heyyanka Foundation graciously offered his facilities (a conference room and guest house) to allow us to gather there in August of 2004, as we had 35 people in attendance from six countries. About 20-25 people attended again, at Conference #2 (late August 2005) including the chance to meet some crystal skulls that were discovered in Guatemala. And the third and final event, held in July of 2006, also had about 30 people in attendance including a Mayan Priest from Guatemala. The purpose of the Crystal Skull World Mission conference was to provide a space for individuals interested in the crystal skulls to meet and share information and knowledge. To give you a feel about what happens at the World Mission conferences, there is a link below of various pictures from our 2004 gathering. One of the most mysterious artifacts that has been discovered upon our planet are known as the Crystal Skulls. A Crystal Skull is simply defined as an ancient artifact discovered made from various type of quartz crystals that has the appearance of a human size (or larger) and shaped skull. Most of these ancient Crystal Skulls have been uncovered near or within ancient ruins located in Mexico or Central America, possibly linked to the Mesoamerican cultures of this region. However within recent years, crystal skulls are now surfacing or being reported in other parts of the world such as in South America, Europe and Asia. 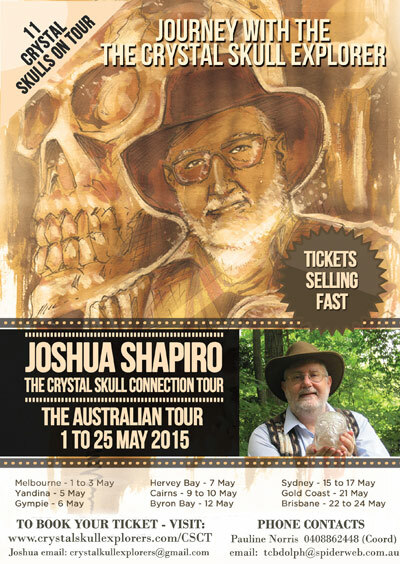 a Crystal Skull Explorer Joshua Shapiro is known as a Crystal Skull Explorer and has been working together with his divine life partner Katrina Head since 2009. 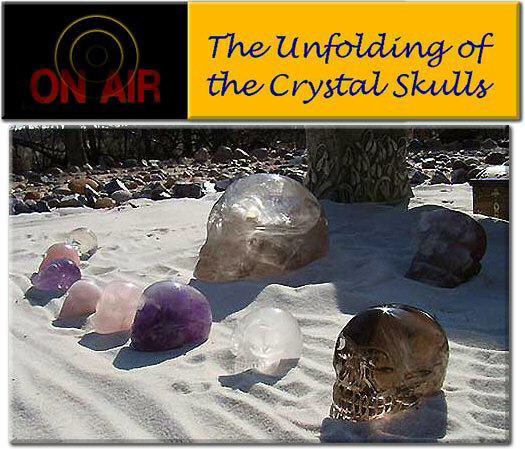 Over the years, he has offered numerous special public events related to the crystal skulls including helping to organize various public and on-line festivals and conferences where several crystal skulls and their guardians have come together. Joshua saw his first ancient crystal skull in San Jose, California in 1983, made from amethyst quartz crystal which is known as "Ami". Over the years, Joshua has given numerous presentations throughout the U.S., Europe, South America and Australia. 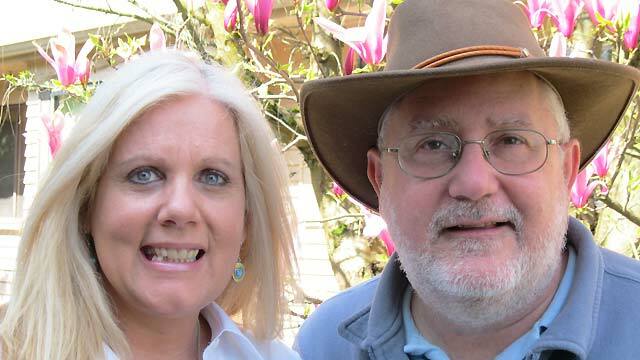 He is also a crystal skull investigator and author and the co-caretaker of more than 30 crystal skulls with Katrina. Joshua Shapiro was the coordinator for the World Mystery Research Center, a non-profit center setup to research various world mysteries from both a scientific and paranormal perspective from 2000-2008. 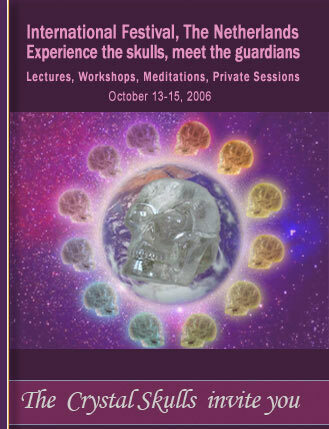 Starting in 2004, three crystal skull conferences were setup in Switzerland through the Heyyanka Foundation in Switzerland and two International Festivals, the first in Holland in 2006 and a second one in Hungary in 2007. Joshua and his partner Katrina, also helped to organize and participate in another crystal skull conference in Holland in March, 2011 with other various friends. Joshua is the sponsor of this website called V J Enterprises that was one of the first websites in 1995 to begin to share information about the crystal skulls. In 1985, Joshua met Sandra Bowen and F. R. 'Nick' Nocerino and through this association became aware of a number of the older crystal skulls known at this time including the Mayan Crystal Skull , the Mitchell-Hedges Crystal Skull and the Texas Crystal Skull ( also known as "MAX"). In March of 1989, the three of them released their first book entitled: "Mysteries of the Crystal Skulls Revealed", which was also published in Brazil in Portuguese in 1992. Moving in the 1990's and beyond, Joshua became acquainted with several other skulls including "ET", "Windsong", "Rainbow" & "Madre", "Synergy", "Skully" and had a chance to visit with the British Museum Crystal Skull several times. In 1999, he received his own crystal skull as a gift , a 10 lb. smoky quartz skull made in Brazil which is known as "Portal de Luz". In 2001, Joshua's first crystal skull presentation in Holland then resulted in him moving to this country to work on a new book that was published in Holland in 2006 entitled "Kristallen Schedels" (Crystal Skulls). By the time he left Holland, he had a collection of three crystal skulls and begin to distribute his free crystal skull e-book (which provides photos of these skulls). 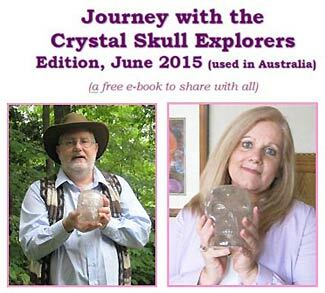 The Crystal Skull Explorers book was also published in Hungary in 2008 as well as Poland in 2004. Starting on January 1st, 2008, Joshua began a series of world peace meditations with the crystal skulls, which continues to the present time. Each year 13 meditations are performing with at least one a month on the 13th day at the 13th hour. You can learn more about these world peace meditations by clicking here. 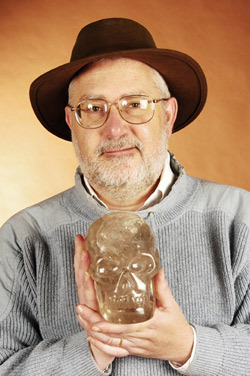 In 2008, he returned to the U.S. and became involved with a number of media interviews about the crystal skulls due to the release of the 4th installment of the Indiana Jones film having a chance for his first private session with the Mitchell-Hedges Crystal Skull. 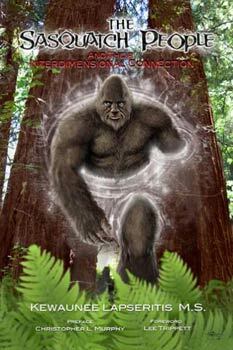 In 2009, he moved to Atlanta, Georgia, where he met his divine life partner and fellow Crystal Skull Explorer, Katrina Head and they have been working together ever since. In 2009, they created the new company, Crystal Interdimensional Journeys & Explorations, LLC and led a spiritual tour to Peru in November. From October of 2010 - through February of 2011, they travel from the East Coast of the U.S. to the West Coast (going through NW Canada) to offer their crystal skull event and then decided to base themselves near Seattle, Washington where they currently are based out of. Together Joshua and Katrina released their first book together as an e-book for their readers (including a Kindle version), the Crystal Skull Travel Log Series, Travel Log #1 in May of 2011 starting with Joshua and Katrina's travels to Mexico in 2009. From 2014-2017, Joshua and Katrina were instrumental in helping the Crystal Skull Hearts Council and friends to create a special day of Celebration for the crystal skulls called Crystal Skull World Day - where thousands of crystal skull guardians joined in for a special mediation for world peace, taking place near November of each of these years. 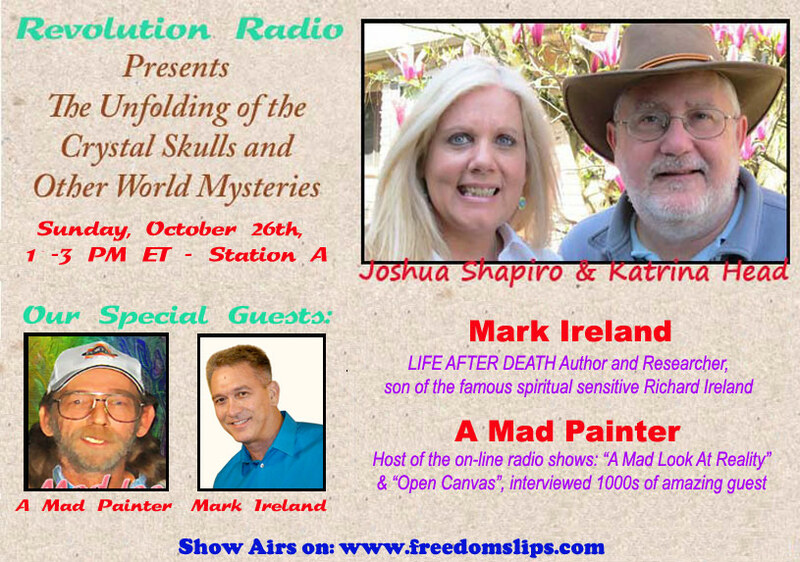 In 2014, Joshua and Katrina returned with their own radio show called "Unfolding of the Crystal Skulls and Other World Mysteries" from July to October of this year shared on the Revolution Radio. Then in 2016 from June to November, the Explorers were guest host for E.P.I.C. Voyagers radio. Over the years Joshua has been invited to be a guest on many spiritual and paranormal radio shows. 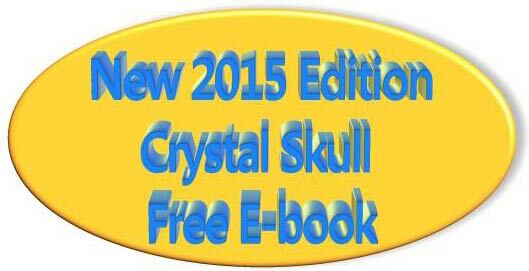 In the beginning of 2016, the Crystal Skull Explorers began a special on-line membership. 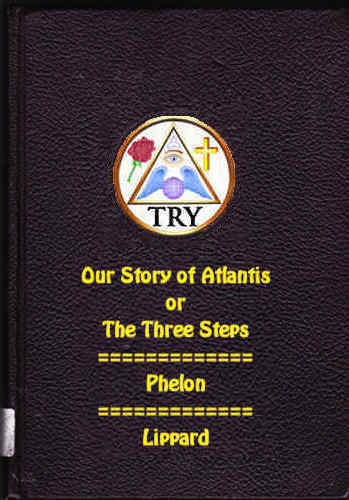 This membership allowed those who joined to read each month a chapter of two novels that Joshua was working with two friends (Karen and Maria) so that the members could read a chapter a month as well as special audio interviews Joshua had conducted with spiritual teachers and mediums with special articles Joshua had written in the past and never released publicly. The name of the two novels, both of which eventually will be a trilogy series are: "Crystal Skull Chronicles" and "Journeys into the Unknown and Back Again". "Crystal Skull Chronicles" was originally created in a movie script format working with a friend in Australia (Terry) back in 2001 of which several version of the script was created. There is a small graphic below on this page where you can read the original story ideas. The last version of the script was done about 2007 and then Joshua felt in 2015 he needed to tell this story as a novel and found Maria, a member of the Crystal Skull Free mailing to help him. The first book writing was done in the summer of 2017 and it is hoped before the end of 2018 this novel will be released to the public in both a printed and e-book form. 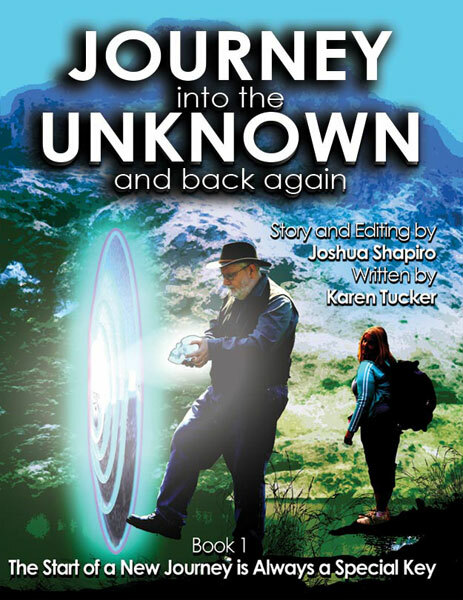 "Journeys into the Unknown and Back Again", mentioned before came to Joshua as a vision in April of 2014 when he was asking the question, "What If, there was a way to prove the existence of the 'After-life' and other dimensions of existence our soul visits, how would this change the world. Again, Karen another member of the free crystal skull mailing list volunteered to help and the writing started in 2015 with the first book of this series also finished in 2017. The first printed edition and e-book was released to the public in January of 2018 and work on the second book has already been started. To learn more about this novel series click here to visit the novel web page. From 2018 and going forward, the Crystal Skull Explorers plan to update and revise the two Travel Log books published earlier and to have both the 1st book in their two novel series ready. Joshua continues to believe that one of these novels will eventually be turned into a feature film and awaits the opportunity to present itself. The Crystal Skull Explorers stand ready to share new and updated information about the crystal skulls in all forms of media as well as doing public events. They seek to continue to work with other crystal skull teachers, guardians and researchers to co-create new events and activities which teach about the crystal skulls and find ways to promote world peace. Secret Images inside the Crystal Skulls? publicly, please do not hesitate to contact us.